Russia’s General Staff gears up for large-scale strategic military exercises in view of possible Israeli and U.S. attacks on Iran. 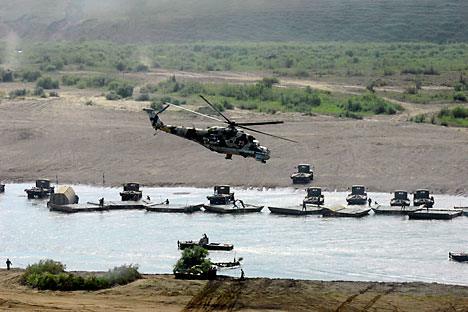 Russia’s Defense Ministry has begun preparations for the Caucasus 2012 strategic command-and-staff exercise (SCSE). According to the ministry’s official announcement, this year’s exercise will be held on a larger scale and more in line with the current military and political situation than the one held in 2011. The maneuvers will take place not only in southern Russia, but also in Abkhazia, South Ossetia and Armenia. The Caucasus 2012 SCSE, scheduled for September, is expected to be the most important military event this year. The exercise plans are now being developed, but military experts believe that preparations for the SCSE will include real combat training missions in light of threats by the United States and several other countries against Iran, as well as other potential conflicts in the Caspian and South Caucasus regions. These exercises have been conducted for several years already, but this year’s event is significantly different from the previous ones. First, this year’s exercise will be strategic instead of merely operational-tactical. This means that missions in the Southern Military District’s responsibility zone will be practiced by all branches and services of the armed forces, including the Air Force, Navy, Strategic Rocket Forces, Military Space Defense Forces, and Airborne Troops, as well as security forces from the Interior Ministry, Federal Security Service, Federal Protective Service and the Ministry of Emergency Situations. The country’s entire military structure will be involved in completing the SCSE missions. Second, one of the main objectives of the maneuvers will be to drill new, network-centric combat operations involving new automated control systems. The first official announcement of these plans was made by Chief of the General Staff Nikolai Makarov during a meeting with foreign military attachés last December. Now Makarov’s words are being supported by concrete actions. Official sources from the Southern Military District have stated that units deployed in the North Caucasus have been supplied with nearly two dozen upgraded command vehicles with the Global Navigation Satellite System (GLONASS), used for topographic positioning and surveillance. These will be part of the command center of each motorized infantry and tank battalion. GLONASS is now used in all new helicopters and combat planes that conduct surveying in the district’s responsibility zone, as well as by artillery and air defense. The fleet of aircraft in the Southern Military District has been nearly completely upgraded. The army has also been equipped with Barnaul-T, a new automated control system for air defense forces, which already controls not only Russian airspace, but also the airspace above the entire South Caucasus. This is important for the Russian 102nd military base in Armenia, which is separated from the Southern Military District’s main forces. Tsyganok also quoted Igor Gorbul, head of the Southern Military District’s press service, who said that the district’s military pipeliners, “in preparation for the Caucasus 2012 SCSE, have started, as part of their practical skill training, to deploy trunk lines and pump fuel.” Pipeline forces exist as a separate branch of troops in Russia’s army. Although the Caucasus 2012 exercises, the preparations for them and the completion of relevant missions are planned in advance, they can be seen as having some relation to foreign affairs. First published in Russian daily Nezavizimaya Gazeta.